Some of you might be wondering 'what the bloody hell is Pantone when it's at home?' or 'why does it matter what they think?'. Well, Pantone is a company which produces a colour matching system which designers around the world adhere to. It makes sure colours are standardised which means that there is a guaranteed match without the need for comparison- very handy for manufacturers around the world! Because so many designers across the globe use these colours Pantone has a great amount of influence within the industry. Every year they have a summit with various people in charge of colour standards (what a job!!) and they sit and debate what is to be the colour of the year. As you can see from the image below, this is often based on the current social climate and it often has a huge impact on fashion and design trends for that coming year. Everything from blouses, cardigans and scarves to toasters and microwaves start popping up in the new, trendy colour. So what does this mean for wedding planning? 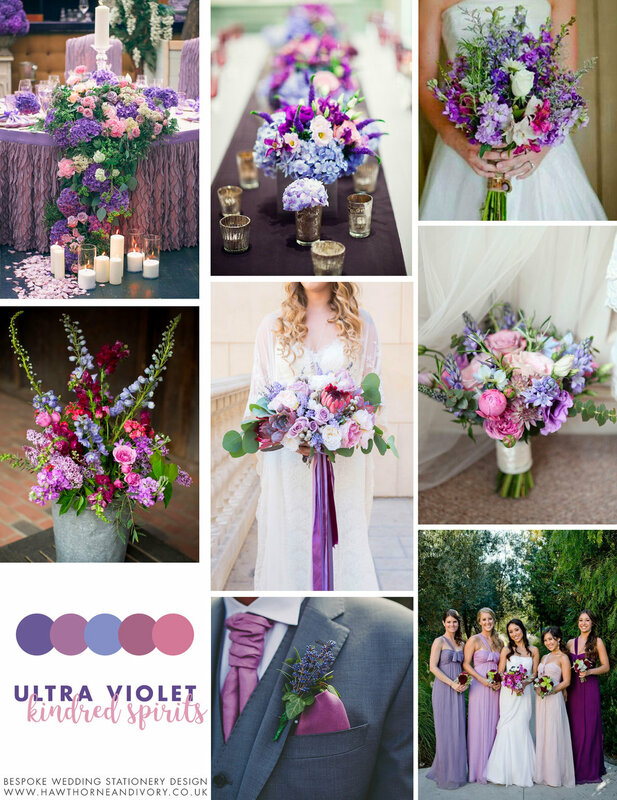 Wedding planning and popular wedding colour schemes are very much inspired by the Pantone pick and past colour of the year choices are still proving to be very popular. Choices like 2015's Marsala and 2017's Greenery had a huge impact on wedding trends with gorgeous rich burgundy bridesmaids dresses and lush foliage decorations and bouquets popping up all over Pinterest and popular wedding blogs. Honesty time... this isn't one of my favourite colours that Pantone have picked. I'm just not a big fan of purple! I do think it can fit beautifully into a colour palette rather than just being used on its own and I spent a lovely afternoon browsing Pinterest for some ideas to show you just what I mean! 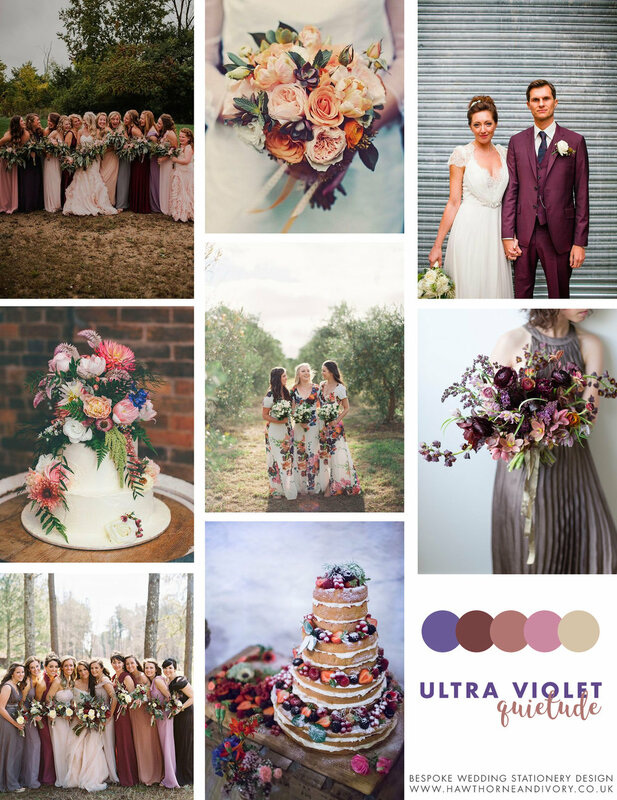 By adding in a range of different shades and tones of purple to the first mood board (Kindred Spirits), the overwhelming vibrancy of this year's Pantone colour is softened and makes way for a gorgeous colour palette. You could dress up to be as luxe as you like with lush fabrics, candles and floral garlands or go for the heartfelt and more rustic vibe with lovely pastel bunting and milk churns overflowing with flowers. For Purple Haze we get a little whimsical by adding in sage and a hint of turquoise. This palette lends itself to the super on trend succulent so you're sure to get some unique and modern floral arrangements for both your bouquet and table decorations. Swathes of lavender are another perfect fit, can you imagine the scent in the air of that field?? Last but certainly not least is Quietude, this is my personal favourite of the bunch. It gives me a bit of a Wes Anderson feel- like maybe if Margot Tenenbaum stayed at the Grand Budapest hotel. With plenty of warmer tones it makes the whole day feel more welcoming and would be just perfect for an Autumn wedding on a crisp October day. 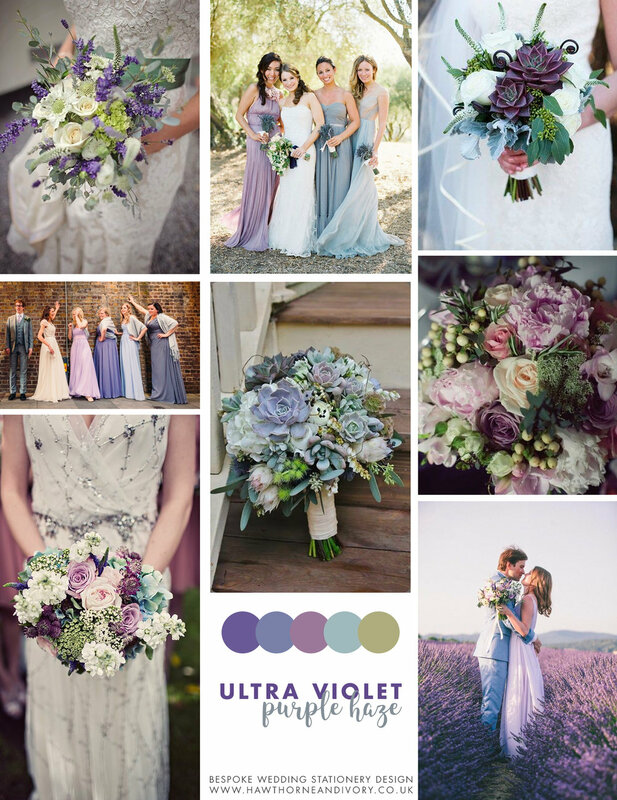 With muted tones of rose and peachy beiges doing their part, Ultra Violet becomes a fabulously surprising accent colour that you can seamlessly add to bridesmaids dresses and floral arrangements. There are a million and one different ways you can personalise colours to suit you on your wedding day! These are just some ideas and images that stood out to me. If, like me, purple isn't one of your favourite colours and isn't your first choice for a wedding colour theme stay tuned for more blog posts which will be focusing on different gorgeous colours you could pick!